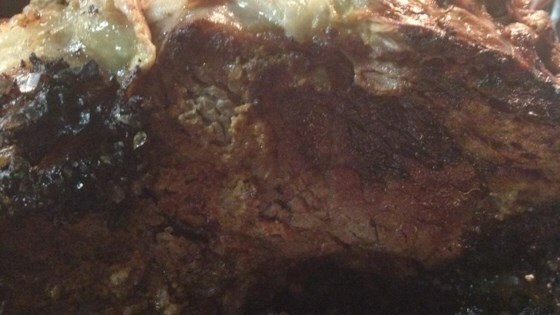 "This is a very juicy prime rib which is easy to prepare. Surprisingly, it is not too salty and you can't taste the mustard. The horseradish sauce is great. Serve with Yorkshire pudding, or with a baked potato and a salad." Preheat oven to 450 degrees F (230 degrees C). Line a roasting pan with aluminum foil. Liberally coat the roast with mustard, so that it is entirely covered. Put a thick layer of rock salt on the foil in the roasting pan, about the size of the bottom of the roast. Set the bottom of the roast on the salt, and press down to embed the salt into the mustard. Completely cover the remainder of the roast with rock salt, pressing it into the mustard. (A lot of salt will fall off into the pan, but that doesn't hurt anything). Bake uncovered, in preheated oven for 60 minutes, or until internal temperature reaches 145 degrees F (65 degrees C). Let stand 15 minutes. The roast will be encased in a 'shell'. Hit the shell sharply with the back of a knife, and it will crack open and start to fall off. Remove the shell, and place the roast on a cutting board. Slice, and serve with horseradish sauce. Horseradish sauce: In a small bowl, whip the cream until stiff peaks form. Fold in horseradish to taste. WOW! Yummy! I used regular salt. The roast turned out awsome! There were 14 at our Dinner Party and not a plate had any food left on it! This one is definatly a keeper! I made this for Thanksgiving, and then again last weekend.... It has been requested for Christmas, too! This produces a restaurant quality meal, which was an instant hit with everyone! Did this for Christmas dinner. Turned out excellent.